Yeah, I was afraid of the truth. After several years of not going to the dentist, Hunter and I went today. Hunter had to go before Kindergarten, and I joined him. I was seriously afraid of the amount of cavities I might have. I have also known for years that I need my wisdom teeth pulled, but we haven't been able to afford it. Tone got his pulled last year, and we made a deal that this year was "my" year. Divide up the costs, you know. Hunter did fabulous. We were there for 2 hours, and he sat quietly and played with his Leapster. He did exactly what they asked him to do, and I was proud. Plus, he got a clean bill of health. No cavities! That kid lives for sugar and he has been known to grind his teeth, so I was a bit afraid. I brush his teeth really well and have trained him to not grind anymore, but I was still worried. Then it was my turn. Whew! I only had one small cavity, and an old filling that needed to be fixed. Of course, then there were discussions of other problems. I was told that my wisdom teeth had pushed my others, and I needed braces again. Duh. I could see that, but after 8 years in the braces, there is no way I am going back to that now. Plus, the work would be so minimal. My teeth look straight on the top and only a little crooked on the bottom. Then I was told that my gigantic gummy smile can be fixed, and that "I would look a lot better." Apparently, my jaw mandible sticks out too far and the bone can be shaved down, placed differently and fixed surgically. Oh gee, thanks for those kind words and that interesting description of what they can do. Thanks, but I think I'll pass on plastic surgery. After years of getting used to my gigantic smile, I would feel a little lost without it. It's who I am, and I am perfectly happy with it. 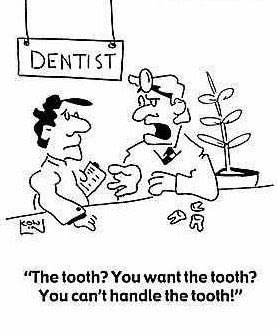 And the wisdom teeth? The two bottom ones are impacted. She offered to take all four out that day. Thanks, but I think I need to schedule this when Tone is home and I don't have two little ones to tend to. Also, she added as a sidenote, she takes them out, but doesn't put people under. She just numbs the area. That ought to be super pleasant. Tone was put to sleep for it. Lucky. So as I as considering going to someone else who can actually put me to sleep for wisdom teeth removal, they showed me the bill for: deep cleaning, cavity and filling fixed, and teeth removal. It was $269 for everything. Whoa. We paid WAY more than that for Tone's. So I am seriously considering gutting it out and dealing with being awake, just to save money. Also, I have this crazy fear of what I might say when I'm being put to sleep. I've heard all these stories of what people blurt out, and I just am a little afraid of the deep dark secrets I may share. Hey, maybe with some of the money we save, I can treat myself to a new pair of shoes. That would be totally worth it to me. I just read several blogs at the same time. So I'll comment on all of them. I love the flagstone walkway - it's really beautiful. The stories about Roberta were really funny! I enjoyed all the pictures. It was great talking with you on the phone last night. Love you! Okay, I have to comment on the whole anesthesia thing. I had all 4 teeth out at once and got knocked out for it. Let me just say that the aftermath is miserable, and I can't even imagine being awake for what must have taken place! But, that being said- I just paid $600 out-of-pocket for 30 minutes of anesthesia (and they didn't even knock me completely out!) for my lymph node biopsy. See if you can find out how much you'll have to pay if they knock you out and how much you'll have to pay if they don't. I wouldn't worry about saying anything stupid. LOL. They legally can't tell anyone anyways! Haha.